what is the longest exposure you have managed with a CPC 9.25 scope on a HD Pro wedge? I was trying to image M51 last night and was trying 120 second subs at ISO 1600 and had star trails. is an exposure of 120 seconds an unrealistic expectation with my setup? I have an Evolution and its wedge and I managed 120 seconds last night. However, I left nothing to chance. I used GPS for accurate Time-Loc. I used Starsense for my first Auto-align. 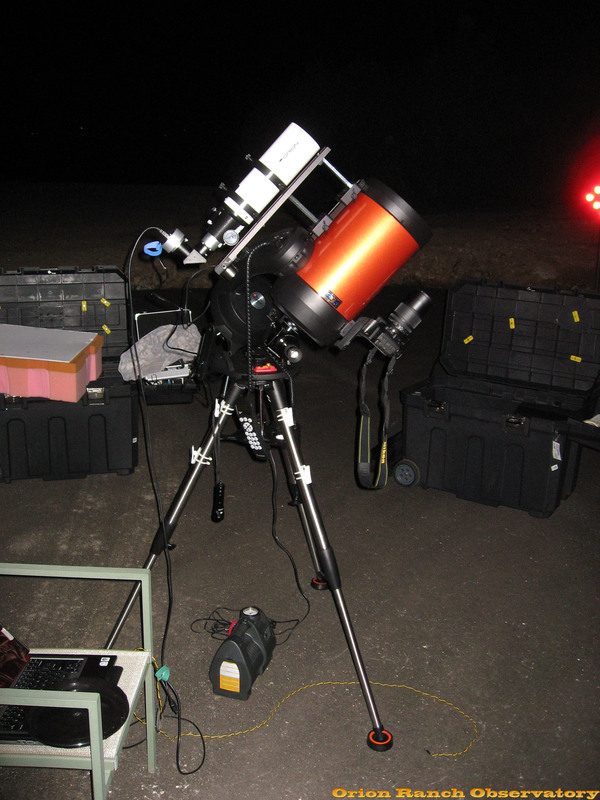 I then calibrated Starsense camera using a 12.5mm illuminated reticle EP and then realigned. Then polar aligned using Starsense's ASPA routine, again using a 12.5mm illuminated reticle EP.. I then did an auto-align and repeated the process to check I had not left any residual polar alignment error (PAE) or accidently moved my mount during physical alignment. It was a joy to succeed having previously suffered from the infamous Starsense on wedge bug (fixed in December 2018 firmware update). This was my first night back on a wedge for 12 months as I had abandoned my wedge in favour of Hyperstar which renders polar alignment unnecessary.. My reason to use it again was to beta-test the Starsense polar align routine on Alt-Az + wedge in Celestron's new CPWI software. Because of the CPWI requirement to set your Home position with OTA facing North, sadly, this different routine failed at my location. It hit eleven consecutive obstructions and hence failed plate solves because Starsense wants to seek targets very low to the horizon where I have a brick wall and buildings. I gave up after three attempts. I then switched to the regular Starsense HC ASPA on wedge (as above) which requires a Home position with OTA facing South and it succeeded without problem as it sought stars sufficiently elevated. A regular Starsense alignment (no wedge) always succeeds for me in three plate solves, and doesn't require a specific horizon (but works best South for me). Evidently, this is an issue for those that want to use CPWI with wedge and have North facing obstructions (I have reported in TeamCelestron). During the period of the Starsense on wedge ASPA bug I was doing a regular Nexstar + HC ASPA and succeeded with even longer exposures, but there would repeat the ASPA process perhaps three or four times to progressively converge and elimininate the PAE. If using the HC, how many ASPA iterations did you do? I would repeat at least twice to check you did eliminate PAE. In summary, whichever polar alignment on wedge route is favoured it takes infinite care and patience to wholly eliminate PAE. That is why when the frustrations of using a wedge previously got on top of me and faced with buying a GEM mount or Hyperstar I chose Hyperstar. But now I am back beta-testing on a wedge I am now curious if Hyperstar +wedge is a better combination than Hyperstar + no wedge. Put another way, are 120s stacked exposures better than 60s stacked exposures at f/2. My limited conclusion last night was the improvement was marginal at f/2 on Hyperstar, but at f/10 (or f/6.3 with reducer) the difference would be far more significant. I propose to persevere for a few more nights to explore. Those that followed my previous Cloudy nights journey on a wedge will think me mad. I should have bought a GEM! However the Starsense HC ASPA routine now looks promising. Others, never easy. Edited by Noah4x4, 29 March 2019 - 03:11 AM. Thank you for your answer. I've followed the three threads about wedge / bug and used the procedure in the definitive thread with what seemed like promising initial PA errors. Last night was my first serious attempt and used GPS for time & location data. Used an RICA illuminated finder scope and illuminated eyepiece to improve matters. Goto was pretty much spot on after an auto align and ASPA. I'm delighted that 120s is possible and will have another go tonight. The key factor David is that it is ultimately a mechanical procedure that even if aided by Starsense or HC software concludes with some physical knob fiddling and the limitations of human eyesight. What most struck me when we developed the (then not properly documented) procedures in the original threads was how hard it was to determine when a calc-star is accurately in the centre of the originally supplied (with Evolution) 25mm eyepiece. I would centre it in the 25mm and it would be nowhere near the centre of a 12.5mm EP. One needs to consider the FOV to recognise the likely degree of PAE error this entails! I became manic obsessive with the Nexstar + HC ASPA getting PAE down to single figure 'seconds' perhaps proving that a Alt-Az + wedge can mirror a GEM. But that success might take me three iterations of the ASPA, each time converging the PAE. What was happening with the Starsense 'Bug' was the first two would improve then the third or fourth would be miles out, but that glitch has been fixed. I reckon one iteration (using any ASPA routine) and you are probably fine for 60 seconds. But it might require two or three for 120 seconds. If you wish to go longer it might take three or more repeat attempts to get to the required trivial PAE. That is why a GEM is undoubtedly best for long exposure AP, but a high quality ASPA is far from impossible on a wedge, it just takes more care and patience, which I didn't have. This is why so many folk with Alt-Az have switched to stacking very short exposures, which is enhanced by Hyperstar. If you struggle, Hyperstar or GEM is your next option. I chose Hyperstar and have not regretted, but am now experimenting with Hyperstar on wedge, simply because of the user testing I have been doing for CPWI. First impression is that 60s or 120s doesn't make a huge amount of difference with Hyperstar at f/2, but conditions were not great and I was soon beaten by cloud. Hence, take your time, do at least two iterations (the second to check for any residual PAE). Also make sure you are on firm ground. When knob twiddling, it's easy for your tripod to sink into soft soil/grass and throw you out. The next frustration is you eventially discover you have developed the skills for 10 minute exposures and never again find a sufficiently long break in the clouds! Edited by Noah4x4, 29 March 2019 - 05:23 AM. - are the trails smooth or jagged at all? - what direction are the trails in (N/S or E/W)? Yeah, some of this takes a little bit of math and some poking around, but it will tell you a lot about what is going on. For example direction will tell you if the problem is polar alignment or periodic error. Edited by mclewis1, 29 March 2019 - 09:52 AM. "I've followed the three threads about wedge / bug and used the procedure in the definitive thread"
So I'm new to this forum, and a new owner of a NexStar 8SE with Starsense and an EQ wedge. Can someone please point me (and possibly other newbies) to the "definitive thread" mentioned here? And maybe also to the "three threads about wedge / bug"? P.S. I've had a lifelong interest in astronomy and astrophotography, but only recently had the opportunity to pursue the latter practically (hence the purchase of a NexStar 8SE with Starsense and an EQ wedge). I think I have a good understanding of the geometrics and mechanics involved in astrophotography, it's just the specifics of the system I've purchased that I'm new to. So following up on Mark's comments, the first issue for unguided imaging is whether or not you have a good polar alignment. If you're setting up and tearing down each session, the answer to that is almost always a definitive "No!" It takes a lot of tweaking to get a really good polar alignment and it's unlikely you'll spend the time in a single evening setup. From there, you get into the question of the mount itself. From my experience with my Deluxe CPC, the drive train just isn't that good, regardless of how much I tweaked it. (Of course now I know the problem with DEC guiding on ALL Celestron mounts prior to just recently is a firmware design flaw, but that's a different story). As Mark alluded to, if you're using full magnification on your scope, the problems will be much more obvious as your magnification is getting higher than the accuracy of your system. To Carl, the SE mount is of course even worse, but you're at a slightly lower magnification. The reality, however, is that a lot of things you'd like to photograph require a lower magnification anyway. Somewhere around here is an entire thread on all the nonsense I went through making my 8SE into an astrophotography setup. Did ok, but was largely a waste of money. 120" unguided without star trails using a mass produced mount is probably about as good as it is going to get . Most mass produced unguided GEMs can not go beyond 60" without producing oblong stars. Unguided, I am able to get perfectly round stars for a maximum of 300" with my GEM at a focal length of 1,623mm. However, my GEM is a $10,000 mount. Edited by Stephen Kennedy, 29 March 2019 - 09:30 PM. If you search for 'Starsense on a wedge' you will find a number of threads that might confuse rather than help you as we struggled for some months to beat the 'bug' and define Starsense on wedge processes that work. Here is a simple guide to using Starsense on a wedge in the Northern Hemisphere. 1. 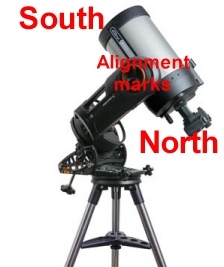 Set up your scope like this; with OTA at its regular index marks aimed South. You then set wedge scale to your latitude, hence why it leans as per this image. 2. Via the HC Menu set Wedge = Yes. 3. Perform a regular Starsense autoalign, just as if not on a wedge (command 2 is important). 5. Press <Align><Polar Align>. The HC asks you to centre the star and press Enter. 6. The OTA will now slew away reflecting the polar alignment error and the HC direction buttons will become locked. 7. Using the wedge knobs only , recentre that star and press Enter. 8. Then perform a fresh Starsense Auto-Align. You might have to repeat a couple of times to progressively remove the PAE. This depends totally on your imaging scale (that would be measured in arc seconds per pixel). Image scale depends upon your focal length and the pixel size of your camera. The acceptability of an image also depends upon how closely you look at the results and the kind of reproduction scale you use to display your images. 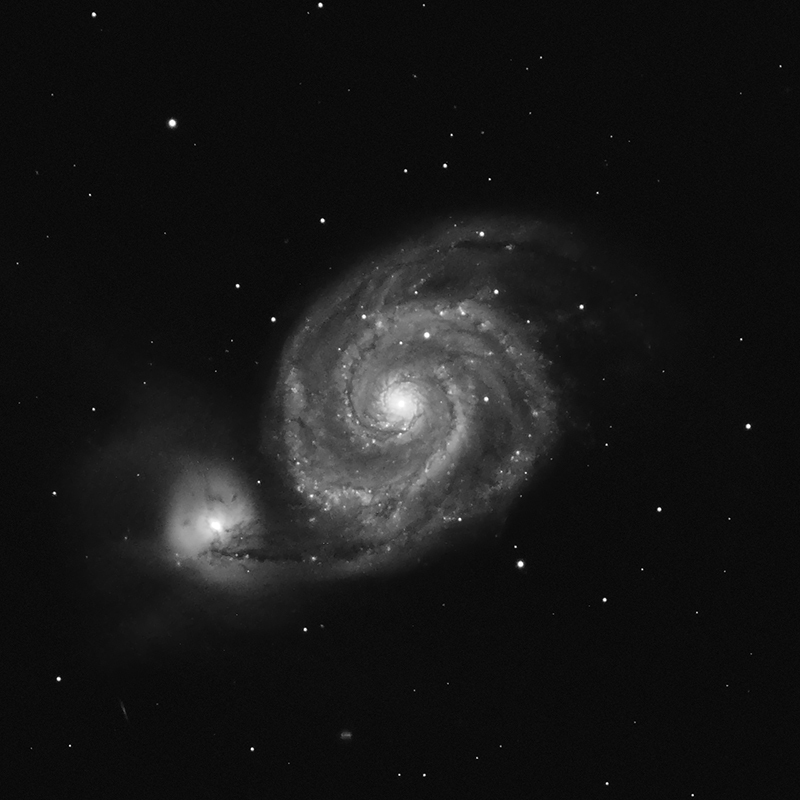 This past week I was imaging with my 9.25" EdgeHD using Celestron's 0.7X reducer (effective focal length approximately 1640mm). However, I was using a camera with small, 2.4 micron pixels (the QHY5III-178C) so my image scale was just 0.3 arc seconds per pixel. My mount was a high-end Astro-Physics Mach1GTO that had been polar aligned with a PoleMaster (probably within a few arc minutes of the true, unrefracted, north celestial pole -- or about as good as you can do without doing a lengthy and careful drift polar alignment). So, what was the length of the UNGUIDED exposures that I was attempting? Only FIVE SECONDS, and even that was difficult. Basically, when you are working at the kind of image scales provided by an SCT you NEED to do guiding (and best case with an Off Axis Guider, as a separate guide scope will probably only be good for relatively short exposures, maybe a few minutes). Of course, if you turn to something like a HyperStar (f/2) then your image scale will be reduced to a much more manageable level. Now add in a camera with larger pixels (e.g. ASI1600 with 3.8 micron pixels) and you could be imaging at something approaching 2 arc seconds per pixel (about six times as large as the example I gave with my EdgeHD). Now, given that 6X relaxation in the image scale, you can probably do unguided exposures for a minute or two or even longer if you aren't particularly picky. By "picky" I mean you pixel peep and still want round and small stars. What kind of difference does this make? After rejecting about one half of my subs for either star size or shape I was able to get an image that had a Full Width Half Maximum (FWHM, a measurement of the diameter of the star's image) of only 1.85 arc seconds in broadband color. Of course, not all of my problems were related to the unguided imaging, since the seeing conditions also matter (a lot). Having said that, if I had attempted exposures as long as two minutes I'm sure that I would not have gotten a single sub that would have met my criteria (round and small, and I imaged over three different nights and collected well over two thousand subs). So, the image scale matters, the seeing conditions matter, and the eye of the behold matters. Frankly, for a CPC 9.25 I would not attempt unguided imaging unless you were using something like a HyperStar or had a camera with VERY large pixels (or both). However, if all you want is a run-of-the-mill image that will only be viewed at a very small size (casually) then practically anything is possible. And, of course, you can get lucky now and then so YMMV. In fact, that's one of the reasons why ultra short DSO exposures are often termed "lucky imaging" (partly due to the seeing conditions and partly due to the unguided tracking provided by the mount). So, yes, IMO "an exposure of 120 seconds an [is an] unrealistic expectation with my [your] setup." Edited by james7ca, 15 April 2019 - 10:25 AM. Thank you James - that's an excellent answer.